As soon as you load up the game you know you are in for something special - Yoomp! 's main menu is outstanding; with it's beautifully pixelled title graphics, rotating starfield, bouncing ball sprite and pulsing stero soundtrack you could easily be mistaken into thinking that you'd actually loaded up a well-coded cracktro instead of a game. Seriously, Yoomp! has set the benchmark by which future Atari XE/XL releases will be judged in RGCD when it comes to presentation. 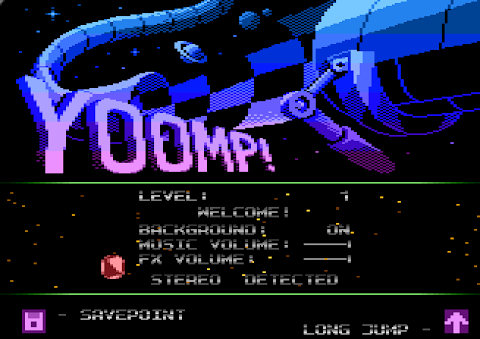 Player controls and the various tile types are identified and explained as a series of messages displayed at the bottom of the screen, and as well as the sound and background options you are also given the ability to continue from any of your previously beaten levels (until the Atari is turned off, of course). This is a really nice feature as it makes the game far more accessible to casual players - after all, there's a quite a lot of game to beat here; a perfect run takes in excess of 20 minutes from start to finish. Regardless of whether or not Yoomp! is based on Trailblazer, the game itself played exactly as I'd expected from T.M.R's initial description and the psuedo-3D arcade/puzzle hybrid action is every bit as addictive as that of the Gremlin Graphics classic. The only obstacle I had to overcome was the fact that the left and right controls really need to be thought of as anti-clockwise and clockwise - for example, when you are upside down on the top of the tube, pressing right will actually result in your ball moving to the left. As soon as I'd got my head around that (which admittedly cost me a life or two), I found myself whizzing through the superbly designed levels with ease. In the opening stages you are gently introduced to the different tile and bonus types, consisting of clearly identifiable patterns for jumps, holes, save points, directional shifters, teleports, tunnel stop and start, increase and decrease brightness, lightning, earthquake - and of course the occasional extra life and long jump pick-ups. A genuinely helpful and aesthetically pleasing aspect of the game-play is that your ball's bouncing rhythm is in time with the backing music, meaning that not only is it easier to judge where you ball will next touch down (which is also aided by it's shadow), but as each tile has a different sound effect your movements effectively add another layer of percussion over the electronica soundtrack - similar (in a very basic sense) to that witnessed in Rez. This, combined with the visual effects caused by the lightning and earthquake tiles, really makes Yoomp! stand-out from it's ball-bouncing peers; it's probably one of the few 8-Bit releases that's (almost) as enjoyable to experience as a spectator as it is to actually play. In conclusion, even when compared to the other high-calibre Atari releases reviewed in this issue, it's clear why Yoomp! was awarded first place in this year's competition - the development team have taken a simple idea and moulded it into an original (at least in terms of perspective), highly polished, fast-paced, visually impressive and highly enjoyable homebrew classic. Download the game here (from the Yoomp! website). Q1. As way of introduction, please could you give a brief paragraph or two about yourself and the team? First of all, thank you for your interest in our work, and a warm welcome to the RGCD readers! Now about the "Yoomp!" team - we are four guys from Poland. Lukasz "X-Ray" Sychowicz did all the music - he is a great composer, considered the best on 8-bit Atari scene, and he's also creating music as a full-time job. Bartek "BeWu" Wasiel did all the graphics, but he also often composes music. In real life he works on various jobs related to design, 3D modelling etc. Piotr "0xF" Fusik (also known as "Fox") helped with programming. He works for one of the biggest Polish software companies. Oh, and I'm Marcin "Eru" Zukowski, the one to be blamed for most of the code (and hence, bugs). I'm doing PhD in computer science in Amsterdam. Q2. On the project's web page, D. Johannsen's 'Jump' and Bullfrog's 'Tube' games are stated as the main influences, but what inspired you to attempt to create a similar game on the 8-Bit Atari? Did you already have a tech-demo proving that the engine was feasible, or was the game built from just the concept alone? 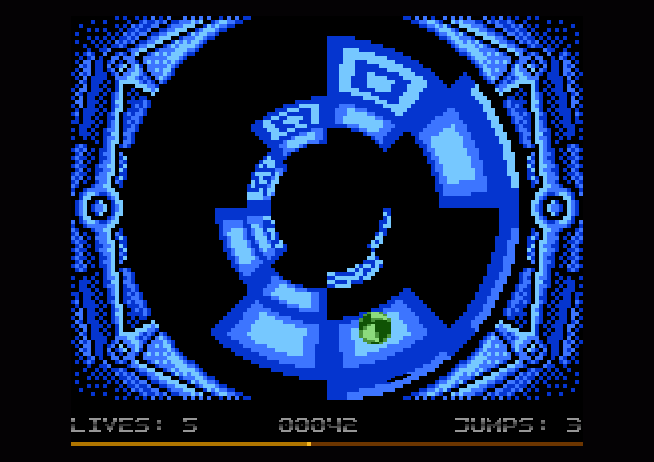 The technique of rendering a 'tunnel' is known for a long time and has been presented in multiple demo programs on Atari. However, typically they either used very low resolution, or required memory extensions. 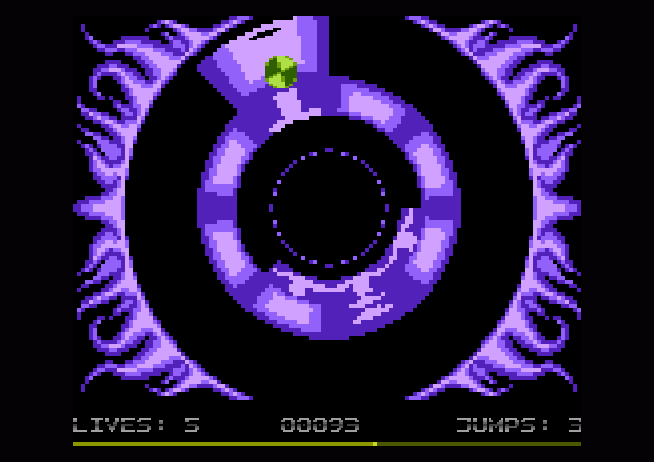 My dream was to do something like "Tube" on Atari, but it looked just terrible in low-res, and the high-res versions I couldn't fit it in a standard memory. But I found that a bit simpler engine can be done in 64KB, and I started to think what kind of game could be done with it. And there came the idea of doing "Jump!" in a "Tube". By the way - the name "Yoomp!" is a tribute to "Jump! ", an English speaker would read "Yoomp!" the way a Polish speaker would read "Jump!". For coding the actual game I used the jEdit editor with 6502 assembly extension, MADS cross-assembler and Atari800MacX, everything on MacOSX platform. Additionally, the game uses lots of tiny C/Perl programs for data conversion etc. We plan to release all the sources at some moment in the near future. 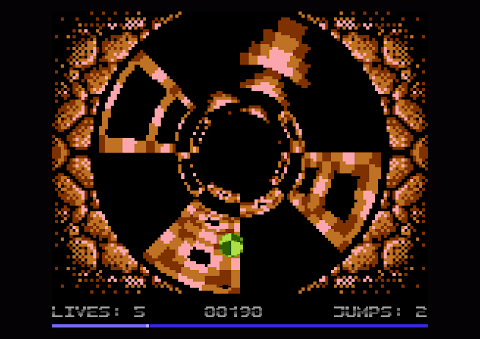 The music was written by Lukasz in Music Protracker running in Atari800Win emulator. Graphics was simply done on PC, and converted to Atari. We would like to use the opportunity to thank the authors of all the used software. The real Ataris were used mostly for testing in the final phases of the development. The development started with a proof-of-concept game, with a very simple tunnel with a jumping ball (you can download it from yoomp.atari.pl). This took just a few days to develop, and gave us confidence that this can be a base for something cool. We quickly progressed, with adding multiple levels, better graphics, music, extra features etc. In the end, the game took around 2 months of semi-intensive work in spare time and then 2 months of quite relaxed polishing. And lots of testing - Lukasz said he needs to play the game to test it, and in the end he got so good at it, he finishes it without losing a single life. Q4. Is this the first project that the Yoomp! team have worked together on? How did you find the experience? Do you live locally or was all the correspondence carried out online? With Lukasz and Piotr we are long-time friends from the demo-scene. We were part of the "Taquart" group, where we worked on numerous projects, including the popular "Numen" demo. Bartek appeared on the scene a few years ago, and he joined Lukasz and another friend in the Grayscale Team (grayscale.scene.pl), where they work together on composing music. As you can see, we knew each other pretty well, and we had experience in cooperation when we started to work on "Yoomp!". And, like in the past, it has been lots of fun. Working in a team of great people, where you help, challenge and motivate each other, is a real pleasure (well, most of the time ;)). Unfortunately, since I live in Amsterdam, and the rest of the guys are in Poland, all the communication happened online. But again, it wasn't the first time, so it was fine. Q5. Were you surprised that Yoomp! won the 2007 ABBUC SW Competition? Did you celebrate your victory, and if so, how? To be honest, we were not really surprised. We knew we had a high chance, as the initial reactions of people were extremely positive. On the other hand, I expected "Crownland" to be a very high quality game, so we definitely were not sure. "Crownland" turned out to be a great game indeed, but the ABBUC members decided they liked "Yoomp!" better. I don't think we really celebrated the victory; it's hard when you live far apart. Maybe, if we meet around Christmas, we will have a beer or five. Q6. What other releases in the competition were you impressed by? I was very impressed by Crownland. Technically it is a piece of great work, and you can see the authors spent a lot of time on it. I know an improved version is still planned, so I expect something even better. I also found "Mule Wars" completely addictive, as long as you can use the "warp" mode in the emulator, as it's a bit slowish at times. And "Eckn" - a simple game, but fun to play. Q7. What's next? Do you plan to work together on another project in the future? Definitely. It's been a while since we released any major demo-scene production, so perhaps in some time you will see something there. But it can still take years, as we're all busy people. When it comes to games, I have a prototype of another engine, and I'm currently looking into possibilities of using it for a game. Q8. Have you considered looking into giving Yoomp! a cartridge release, or approaching a retro publisher like Cronosoft so people can buy official copies on disk/cassette? Something is coming, but I don't want to spoil the surprise. Just wait, and check yoomp.atari.pl every now and then. Also, currently there are attempts to port Yoomp! to C64. There are some technical difficulties, but I hope C64 guys will manage to overcome them, and we'll see a nice cross-platform production. Finally, an Atari Lynx version seems doable. It might happen at some moment, especially if some experienced Lynx coder joins forces with us. Q9. Vintage hardware enthusiasts and hobbyists all have their own reasons for choosing to continue working with their machines. What is it about the Atari 8-Bit range that you love, and do you still think that the scene will be going in another 10 years time? For me, the reason is simple; it was my first computer. I guess many of us have the same reason to still play with it. Additionally, over the years, I became friends with many people from the community, and so I stay involved also for social reasons - it's so much fun to work together and to meet and do crazy stuff. Finally, programming for Atari is just fun for me. And, surprisingly, I have a feeling, that some of the skills I learned while doing it are really useful for my day-time work. Personally, I don't think 8-bit Atari is really that much different from other classic platforms - I very much like what the C64 or ZX people are doing with their machines. But don't tell it to my boss - he's got a C64 in his office, so we are enemies! Will the scene be alive in 10 years? If someone had asked me that 10 years ago, I would have had doubts, so now I also have doubts. But I hope it will. Q10. Thank you for participating in this interview. Is there anything else you'd like to add before signing off? Thank you, and thanks to your readers. We would like to send greetings to all the people that continue to play with the old hardware. It's great to see we're not the only crazy ones! Wow! I was especially impressed by the music, sounds and gameplay being in sync. That seems like it really elevates the experience. Looks superb fun - I think I'll have to grab an emulator and try out the game! The interview was also very interesting to read.